Wow, what a crazy few weeks I’ve had. I recently found out I had cancer (BCC) and as the situation unfolded I was told I needed to go under the knife asap – so I did – not pretty 😉 – I haven’t been able to speak properly for a couple of weeks. Great for my family – I’m sure silence has never seemed quite so golden. Alas, no podcasts for the last 3 weeks so hope you all understand people, that sometimes, one’s health just has to take front seat at the theatre. It’s been an interesting time to ponder about priorities. I’m all good now, but hey, it was a bit of a scare. And so I’ve been thinking heavily about my body, and health and well…… cancer and all those things that go through your mind when life’s not as fab as it could be. I love what I’m sharing on People My Dog Would Like and at the same time I thought I’d take the opportunity to pivot a little into the biotech and health space which I do think will have a significant impact on our lives in the future. So I’m doing a series of episodes that focus on health and the future, in all it’s forms, and how smart new companies are using tech to drive a food revolution that is good for people, communities and the planet. So this week, since managing to hold a conversation without sounding like flubber dubber, I had a chance to speak with Julian Mitchell, Co-Founder of Lifecykel, an Australian mushroom biotechnology company that he founded with a good friend, Ryan Creed, that is kicking serious goals in Australia and abroad. He’s continually exploring our natural world and I must say, he is spectacularly driven when it comes to his priorities – health and sustainability. Here’s Julian above, on the right, with his business partner, Ryan Creed. We talk about what led him into the ‘Shroom Revolution, the future of food, and all the cool things he and his partner and now morphing into doing – biomedical applications, clothing and growing sustainable communities. Julian is a strong believer that the future involves going back to nature for inspiration and combining this with the convergence of new technology will create transformational change for our health and our planet. I just love how a box to grow mushrooms can be delivered to your door and transform the way you are eating at home. Its all about low carbon footprint, high nutrition and well…… so much more. 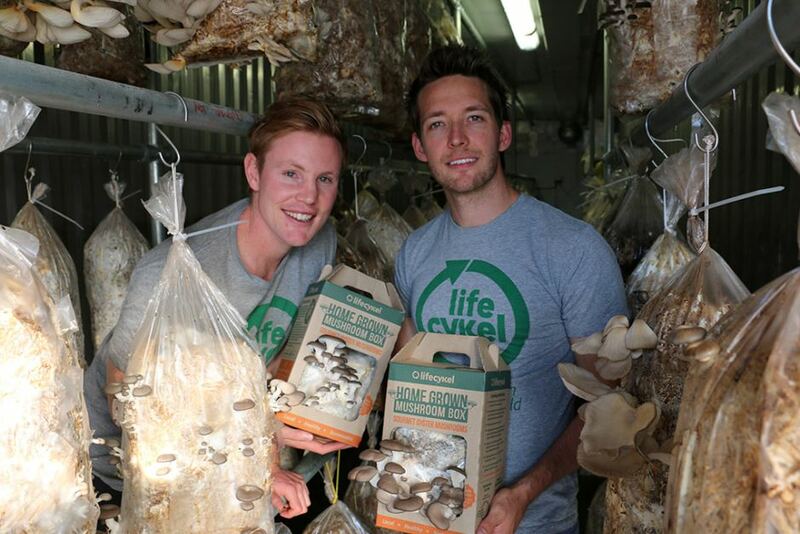 Something I really loved – I know I can be really basic at times – was the idea of mushroom box fundraising which could take the place of sugar in the old chocolate box fundraiser – we touched on how the business is looking into mushroom leather, and also kicking goals in building communities nationally with their shed program. He also shares with us what it was like to work with the English premier league in his past life and who he now looks to for inspiration in the tech and biotech spaces. Lifecykel’s business model is one that I believe will be a raging success, he shared their challenge just to keep up with current demand. Their plans are stellar – I have them in my sights and feel they’ll have a macro impact with their collaborative model which I hope drives behaviour change for many of us. Check out their website here, I hope it inspires you to get online and check out what they are doing in the revolution that is REAL food, and even take him up on Julian’s generous offer of 15% off of all mushroom products for listeners who tune in to the episode. The code is revealed towards the end, I tell you, its magic. I wasn’t going to say anything about the cancer scare, but I thought why not? It’s becoming so common, do people even stop these days and think about what is happening in their lives? i let the little mark on my face sit there for ages. So since the operation, It’s made me take a big step back and think twice about what I want to focus on, who I want to spend my time with and also want to give back when I know in my heart I’ve received so much. I’m not sweating the small stuff at the moment, and I hope in some ways, my little self-disclosure is enough to remind you all to go and check out that funny spot wherever it is, and look after yourselves. And once you’ve done that, I hope you take the time to listen to my upcoming shows where I’m going to go deep on stuff that matters to you – your health, physical and mental, and all the people, business’ and organisations that are taking incredible strides in making our future bright. So much information that is good for the body and for the soul in this current episode, did I also mention Julian is also just a really great human? It’s a turbo packed food revolution info session crammed into 45 minutes, I hope you enjoy it as much as I did. Amazon – I refuse to create a link for this one! If you have any questions, you know where to find me, either shoot me though an message on this site, or through twitter or on instagram – I’ve given Facebook a bit of a miss as I genuinely thought their privacy practices were shite. So…… another thing…… now that I’m pivoting into a health space,n if you’ve got anyone you’d really love on People My Dog Would Like let me know. Am ALWAYS up for cool people out there doing super cool things and sharing their message with my wonderful listeners. Thanks peeps!